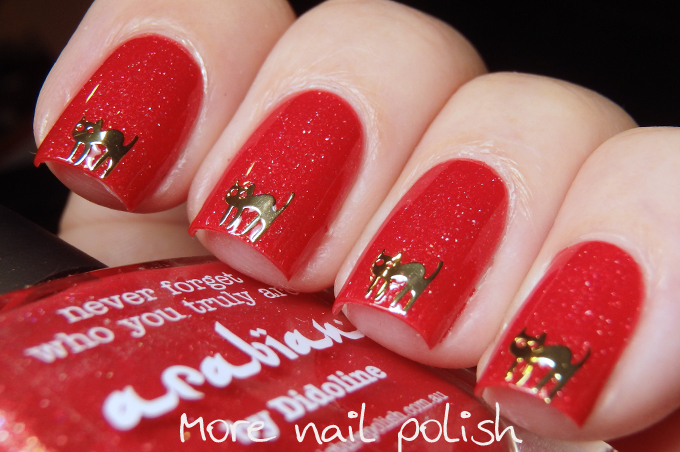 Today I have a review of some gorgeous little gold cat sequins that I received from Lady Queen. 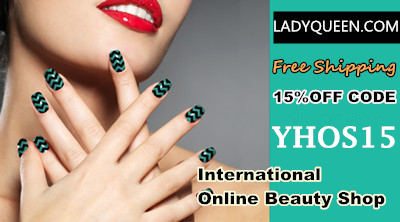 Lady Queen is an online store that supplies a multitude of nail art and other beauty items. The container the cats comes in is a small clear round one and it has 100 pieces. I love that these are very, very thin metal so you can actually roll the cat around a pencil to give it a curve if you have a strong 'c' curve like I do. They lay very flat, but you will want to make sure you put on two layers of top over the cats to ensure the tails and feet dont get caught on anything and stick up. 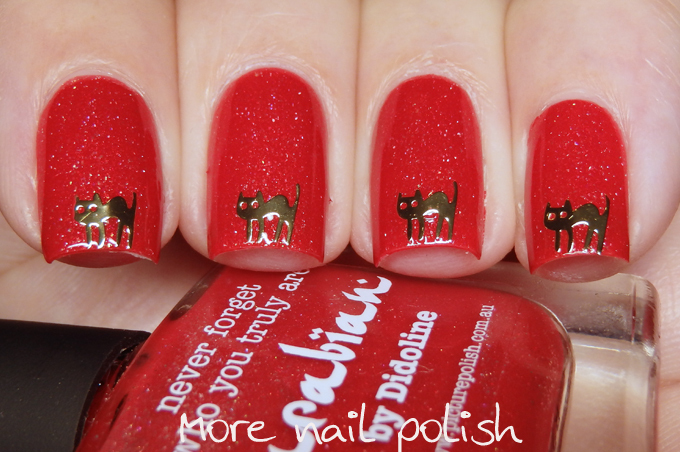 I wish I had these cat sequins before Halloween, as they would look pretty amazing in some Halloween nail art. My base polish here is Picture Polish Arabian, which is a crimson red scattered holo with a gold spark and some rainbow shimmer. Arabian is a collaboration shade with Didoline. 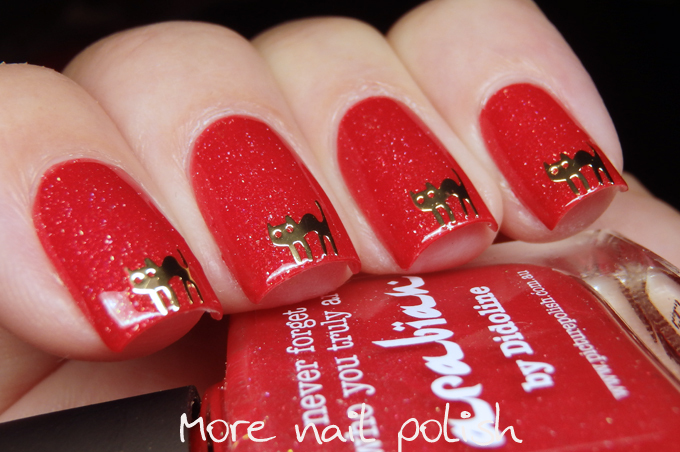 Her blog post has a good comparison of Arabian an o'hara, which is a similar colour, and yes I'm still planning to do a Picture Polish red comparison post one day. Miss 4 is totally a crazy cat lady in the making. She loves our kitties so much and is finally strong enough to pick them up and carry them around. She fell in love with my nails and just had to get matching ones. 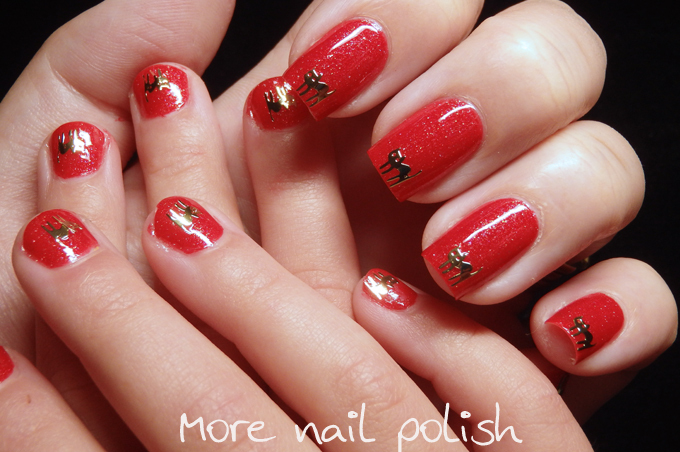 I'm amazing that she actually kept this mani on her nails for three days before they magically fell off (so I'm told!). I also have a 15% off code for you all to use, YHOS15. As these products were sent for review, I can't really comment about LadyQueen's turn around time for shipping or customer service (other than to say they were lovely to deal with when arranging products to review). So I'd love to hear from anyone that has ordered from them to know what their TAT and service is like. 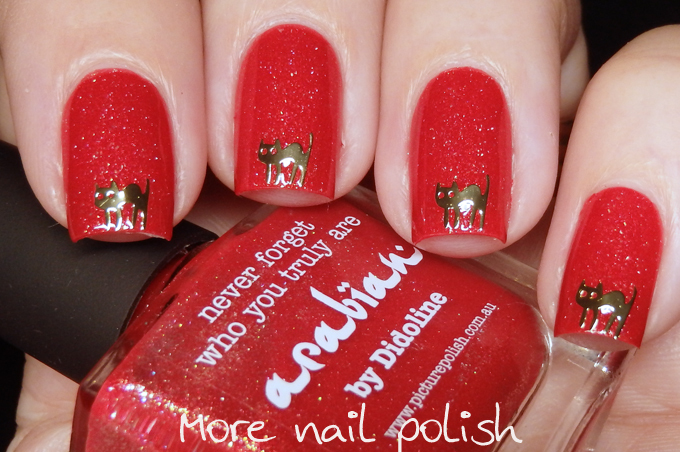 Arabian is such a gorgeous polish.